The Deep Tones originated in 1948 in New York City, though many of their members were born and raised in the Carolinas. 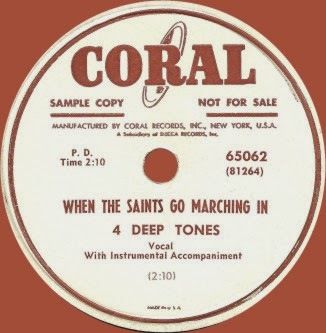 The Deep Tones’ first recordings were spirituals for Savoy and Muzicon. 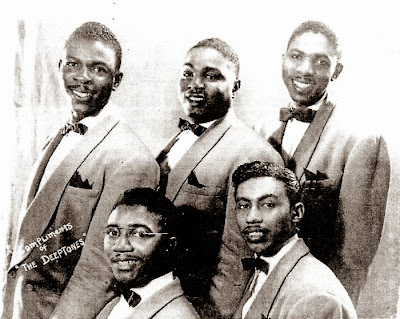 By 1951, the group consisted of George Vereen (first tenor), Calvin Williams (baritone), Furman Haynes (second tenor), Carroll Dean (bass) and Ivy Floyd (tenor) and had also begun singing secular music as well as spirituals. “When you’re in show business you have to do a variety of things; spirituals, blues, jazz,” Calvin Williams recently told Charlie Horner. The group auditioned for Billy Ward when he was putting together the first Dominoes group but was told their harmony was “too good,” meaning too polished. Ward was looking for harmony that had more of an R&B sound and ended up signing some friends of theirs. Members of the Deep Tones and the future Dominoes Clyde McPhatter and Bill Brown knew each other from summertime block parties in Harlem. The Deep Tones were discovered singing in a club by someone from Decca Records who signed them to Decca’s Coral subsidiary. The group was given Conrad “Connie” Frederick as an arranger. Frederick had previously been an arranger and pianist for the Golden Gate Quartet. 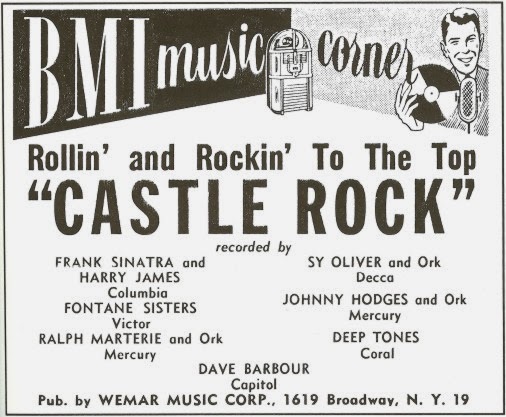 The Deep Tones had one recording session for Coral that produced four sides; “When The Saints Go Marching In,” “Castle Rock,” “The Night You Said Goodbye,” and “Just In Case You Change Your Mind.” Frederick assembled the musicians for the session and also played piano on it. “Castle Rock” was given to the group by the label. It had been written by sax man “Big” Al Sears, who’d recorded it for Mercury while playing with the Johnny Hodge Orchestra (Mercury 8944). As the Johnny Hodge Orchestra song climbed the charts, several labels had their artists put out versions of the song to cash in on the hot tune. 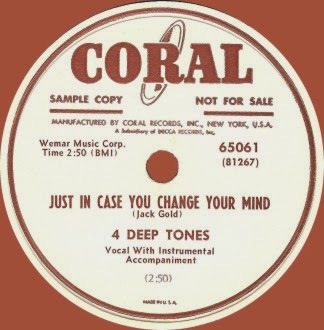 While the Hodge-Sears version was an instrumental, the Deep Tones version had lyrics, with Calvin Williams doing the lead. Conrad Frederick arranged it. 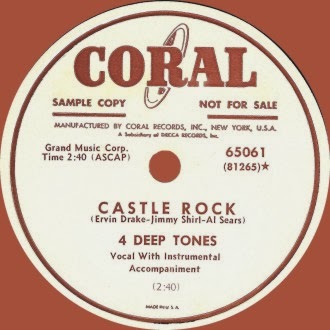 Interestingly, Coral Records chose to call the group the Four Deep Tones, in spite of the fact that there were five voices on the records. In spite of some airplay, neither record did much sales wise. “We got a few gigs from them but that’s about it,” recalled Calvin Williams. The Deep Tones evolved into the Hi-Liters on Celeste and Hico, and the Stereos on Robin’s Nest. 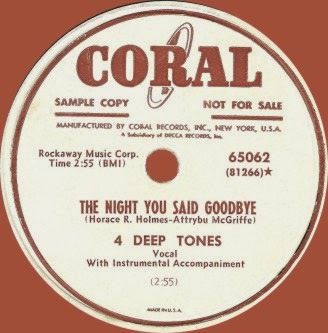 Individual members of the Deep Tones also later sang with the Four Knights (Calvin Williams, George Vereen, Furman Haynes), Golden Gate Quartet (Calvin Williams), Bill Landford Quartette (Furman Haynes), Sandmen (Furman Haynes) and Johnny Smith’s Ink Spots (Calvin Williams, Furman Haynes). Thanks for introducing me to the Four Deep Tones. Pity they never recorded more sides.